On 11 July 1761, a recently kidnapped West African girl of seven or eight saw her journey into slavery end at the home of a Boston tailor and merchant named John Wheatley. She received her master’s surname, with her first name made Phillis—the very same name as the slave ship that carried her to Massachusetts. Her slavers, taken by her precocity and character, gave her an excellent Classical and Christian education. 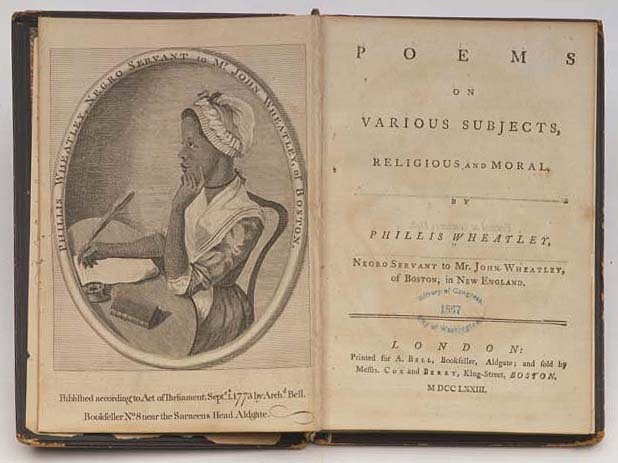 While a slave, Phillis Wheatley became a poet of international repute. Relieved of most of her domestic duties, writing poetry was her vocation. Her poems must be read within the context of her life: that of a slave from Africa, of delicate health, marked by imagination and compassion, who is entirely dependent upon her slavers / patrons for her livelihood. Her protestations against the injustice of slavery are present, if not at the volume we moderns would want. In a poem entitled to “His Excellency, George Washington”, she created a new vision: a classically inspired goddess figure whose sole purpose was freeing the Colonists from the yoke of British oppression. She called this goddess Columbia. Britannia, one of England’s poetic names, also denoted a goddess figure dating from the Roman Occupation. To Colonials with a Classical world-view, it might follow that the American Colonies likewise deserved a guardian spirit. Until Wheatley’s tribute to an upstart colonial general, it seems no writer had developed the figure so completely. According to one analysis, Wheatley created Columbia as an amalgam of Pallas Athena and Phoebus Apollo. Pallas Athena is the armed warrior strategist, and Apollo the god of the sun and poetic inspiration. Columbia’s hair is bound with Athena’s beloved olive branches, and also with laurel, made by Apollo into the poet’s crown. The writer’s assertion that it follows that Columbia comprises Wheatley as poet and Washington as warrior-strategist is interesting but harder to prove. …for in every human Breast, God has implanted a Principle, which we call love of Freedom; it is impatient of oppression, and pants for Deliverance…. We see that Wheatley would recognize Washington’s hypocrisy, but more importantly, she would recognize that the very same principle of freedom living in her heart lives in his. We can imagine the young slave’s identification with this new leader: here is another person who feels oppression—but who actually is in a position to risk all (including a gruesome death for treason), take up arms, and fight. freedom’s cause her anxious breast alarms. With Columbia’s help, Washington may win the freedom that Wheatley hopes eventually will inspire herself and her fellow Africans in America. Perhaps Columbia really does fuse Wheatley and Washington—one fights for freedom with her pen, the other with his sword. In February 1776, Washington responded to Wheatley’s letter, offering his praise and an invitation to meet. In that same month he penned a diffident letter to a friend and associate in Philadelphia, including a copy of Wheatley’s laudatory letter and poem. He was aware of the poem’s excellence, and most certainly, that its publication would aid his esteem as a leader. By April, Thomas Paine published it in The Pennsylvanian Magazine. Herewith, the idea of Washington as Father of Our Country gained currency, and the birth of Columbia as American Liberty was announced. Phillis Wheatley and George Washington met at the Continental Army’s headquarters at Cambridge in March 1776. A view from balcony of the Old South Meeting House in Boston, where slaves typically sat for services. Wheatley was a devout Congregationalist. Kieltyka-Brown Photography, Image Courtesy of Old South Meeting House. You can find information on the end of Phillis Wheatley’s life (she died in 1784) in links below. Henry Louis Gates, Jr. wrote The Trials of Phillis Wheatley, an excellent study of her reputation both in the 1770s and in academia today. In it, he recounts that her poem for which she’s most reviled as a toady could actually be an ingenious indictment of slavery. Here is a searchable, online copy of the 1773 edition of her book of poetry. Look in particular in the first few pages, with the attestation of Boston’s power élite before whom the poet-slave defended her poetic abilities. Here is a fine piece that discusses the alienation that must have characterized Wheatley’s life, and the circumstantial complexities that perhaps prevented her from being the freedom fighter we moderns would wish her to have been. Here is an essay on Phillis Wheatley and her contribution to the mythical aura around George Washington, and generally places Wheatley’s poem to the commander in its social context. A webpage that discusses the difficulties of living in Boston as a freed slave, and of various efforts to ameliorate this condition.